RURAL KING is just a brand name. Look at the bottom edge of yours and note the name EXIDE. That is the parent company who makes it. There are only a handful of companies that make batteries and EXIDE is one. They all manufacture low end models and sell as seconds/cheaper units under different brand names. Many of us also suggest you invest in a float charger -the DELTRAN BATTERY TENDER JR. (6V model) is a popular one. $30 at wallyworld. Keep it connected when tractor is idle and this will prolong battery life by years. Keep records so you can track lifespan. Since you are keeping it as OEM 6V/POS GRN, I suggest to go thru the wiring completely (use your WIRING PICTOGRAMS) before connecting the battery power. Make any fixes now before applying power, never with live power connected. 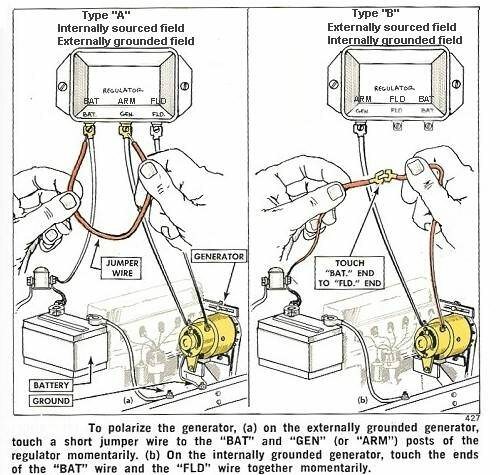 The final step can be, but should not be needed, is to polarize the generator. On the 8N, you can do that right on the Voltage Regulator. POWER OFF, Arc Spark the ARM and BAT terminals with a screwdriver and it's done. NEVER arc the FLD terminal.